10 stone 6 pounds, brown eyes and light brown hair. He was killed in action on 15/7/1916 when a shell exploded near him while he was attending to a fallen comrade. His entry in the Education Department Record of War Service 1914-1918. John M Daniell was only son of John Daniell of Wycheproof, attended Leongatha High School in 1913 and 14, and at the time of his enlistment had entered on his duties as a junior teacher at Leongatha. Resigning his post at the school he enlisted at the age of 17, a fine youth with exceptional physique, 5 ft 11 in in height, and trained as an athlete. Accepted on the 31st of July 1915, he embarked with the 6th reinforcement of the 23rd Battalion in October. 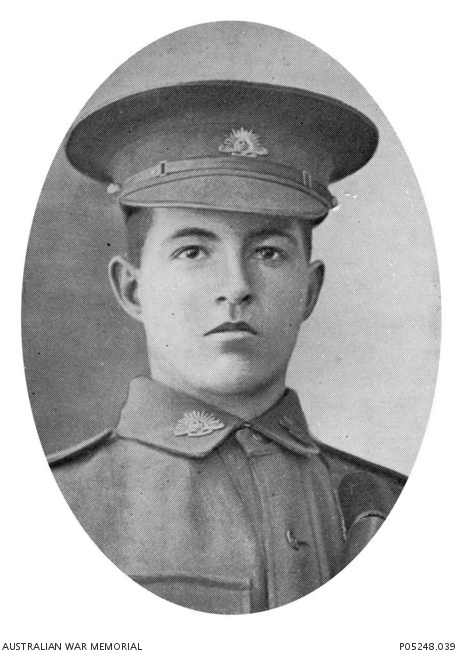 While training at Tel el Kebir, he was transferred on the 23rd of February 1916 to the 57th Battalion, with which unit he went to France. He was killed on the 15th of July by the explosion of a shell, while attending a fallen comrade.